After Avatar showed off its 3-D bestiary to an awe-struck Comic Con crowd, we cornered the blue Na'vi princess Neytiri, Zoe Saldana herself, and asked her to talk a little native tongue to us. The results were phenomenal. It's been a while, so please forgive me if it's a, there's this prayer you guys heard from the panel, that my character does over these animals that she's just fatally wounded. It's in consideration with the relationships that these natives have with their land. It's (speaks in Na'Vi....incredibly hot). If you interview Sam [Worthington, the main character in the movie] please ask him to say that prayer. In other news the new Avatar site is up and running, showing off half of the Na'Vi faces that have been popping up on the banners in downtown San Diego. They only show one half, so we went ahead and did the other half of the leg work ourselves, for the image above. 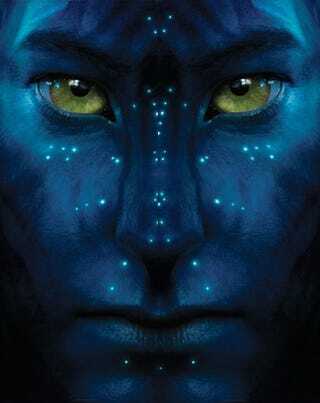 Avatar will be out December 18, 2009.